Alumawood Provides the best option for your patio when compared to wood. When comparing these two covers, you’ll come across various advantages and disadvantages. Alumawood offers the aesthetics wood contains while also bringing the resistance to external elements of regular aluminum. Consider Alumawood patio covers Phoenix for professional installers and installation. Before you make the choice though, let’s take a look at the pros and cons of Alumawood patio covers. Alumawood employs the best of aluminum with paint styles that replicate the feel and look of your regular wood patio cover. To increase its resistance to external elements, the manufacturer embosses and paints the cover. As a result, you won’t have to worry about maintenance issues, as is the case with the natural wood, which requires sanding and repainting. In fact, this patio cover is so durable, that some manufacturers offer a limited lifetime warranty. Since the cover is an aluminum product, its maintenance is super easy. If the material gets dirty, all you need is a water hose and water. You will not have to worry about rain destroying your beloved structure as the covers are interconnected on a slope. Therefore, all water will be guided to the ground or toward the gutter system if the structure is connected to your home. Rust is one of the major enemies that most metals have to counter, but not aluminum. While not all materials used in the Alumawood patio cover are made of aluminum, as a few steel bolts and screws that hold the covers together are necessary, these materials are painted or galvanized to protect against rust as well. The paint will depend on your preferences, but an authorized retailer will take you through the various colors that are available. Remember, with wood patio covers, the paint will fade away, but with Alumawood, the paint remains intact over time. For all the benefits associated with Alumawood, your pocket is bound to take the greatest hit. For example, the price of a square foot of Alumawood installation goes for $12 to $20. 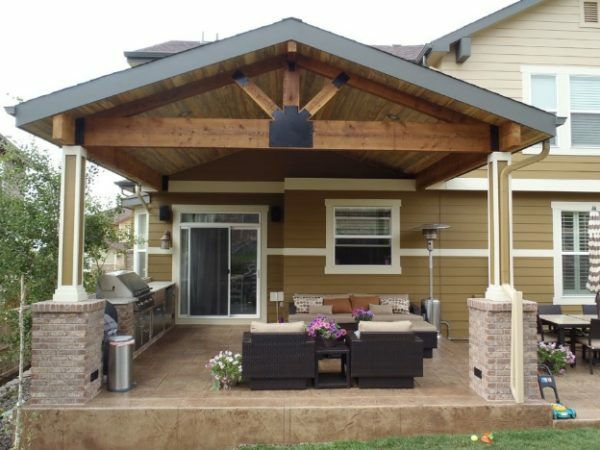 This means the traditional wood patio cover will be less expensive to install, although that will depend on the type of wood you’ll choose and does not include maintenance and upkeep costs. There are cities that require a building permit for patio covers. Others require a permit if the cover exceeds a certain size. For example, in San Diego California, you’ll need a permit for the cover if it exceeds 300 square feet. So, for some, a cover in general may require a permit regardless of material. If you’re one of those that loves a swing on your patio, then you may have to kill those ambitions if you choose Alumawood as your preferred patio cover. However, if you intend on proceeding with the swing, then forget about the dealer’s or manufacturer’s warranty as this may cause an immediate void. Have you ever been in a house without a ceiling during the rain? Isn’t it noisy when the rain impacts the roof, especially if the roof is metallic? Well, that’s exactly what you can look forward to if you choose Alumawood. Raindrops on a metallic roof tend to resonate with sound. These pros and cons offer you a comparative list which you can use the next time you go shopping for patio cover materials. The bottom line is to consider your needs and match them to the materials. If they don’t match, then it is not the material for you.